Liquid diets are usually prescribed before and after surgery. Some people see them as a weight-loss aid. Others have difficulty swallowing or chewing solid foods. No matter what your reasons are, it's important to know what you can eat on a liquid diet to meet your daily nutritional requirements and prevent deficiencies. Rich in vitamins and minerals, bone broth is one of the most nutritious nonsolid foods out there. Its advocates say that it may improve joint health, boost immune function, treat leaky gut syndrome and more. Even though most claims lack scientific evidence, this food makes a healthy addition to any diet. It's a good source of protein, vitamin A, vitamin C, B-complex vitamins, iron, potassium and dietary fiber. As the Center for Nutrition Studies notes, the collagen in bone broth is broken down into amino acids after ingestion. Therefore, it has little or no effect on your joints and bones. Its nutritional value, though, depends on the ingredients used. Chicken cartilage, for example, is one of the popular ingredients in bone broth and contains type II collagen. In a 2016 double-blind study published in the Nutrition Journal, knee osteoarthritis patients who took type II collagen and other joint-support supplements experienced reduced stiffness, pain relief and improved physical function. These beneficial effects were less noticeable in the placebo group. Unless your doctor recommends a clear liquid diet, add Greek yogurt to your daily meals. Loaded with calcium and protein, it keeps your bones strong and helps reduce muscle loss. One cup provides 20 grams of protein, 9 grams of carbs, 11 grams of fat and 220 calories. It also delivers about 23 percent of the daily recommended allowance of calcium. 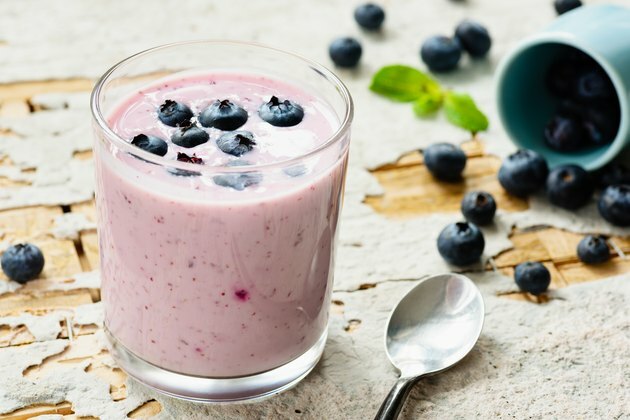 Greek yogurt is appealing due to its high protein content. Whether you're recovering from surgery or trying to lose weight, you want to preserve as much lean mass as possible. According to a 2017 review featured in the journal Advances in Nutrition, a high-protein intake helps maintain muscle mass during dieting. A 2016 clinical trial published in The American Journal of Clinical Nutrition found that men who performed strength training and consumed more protein while in a calorie deficit gained more muscle and experienced greater fat loss compared to the low-protein group. Therefore, Greek yogurt is a good choice for those on a no-solids diet. Add smooth peanut butter to smoothies and freshly squeezed juices to get your daily dose of healthy fats. Two tablespoons provide a whopping 8 grams of protein, which is 16 percent of the daily recommended intake based on a 2,000-calorie diet. This beloved treat also contains omega-3s, fiber, niacin, magnesium, manganese, phosphorus and iron. The unsaturated fats in peanut butter support cardiovascular health. A 2017 review published in the journal Circulation points out that replacing saturated with unsaturated fats may help reduce bad cholesterol levels and lower the risk of heart disease. Furthermore, peanuts and almonds have been found to suppress appetite and increase satiety, making it easier to stick to your diet. From lean meat and fatty fish to leafy greens, there are plenty of solid foods for adults that can help with weight loss and improve your health. When it comes to liquid diets, though, figuring out what to eat isn't that easy. If you're recovering from surgery, it's even more important to nourish your body so it can heal itself and repair damaged tissues. Being on a no-solids diet doesn't mean you must skip meals or give up flavor. Your daily menu can include clear soups and vegetable broth, chocolate pudding, high-protein gelatin, milkshakes, almond or coconut milk, sherbet, ice pops, sports drinks and even water. Just make sure you avoid nuts, seeds, vegetable skins and other solid ingredients that may hide in your favorite foods. Crunchy peanut butter, for example, contains pieces of nuts. The creamy version, on the other hand, has no solid ingredients. Remember to keep your diet varied. Experiment with new smoothie recipes, sip on protein shakes, blend your favorite fruits and vegetables and use liquid meal replacements when you're short on time. T.J. Colin Campbell Center for Nutrition Studies: Drinking Bone Broth – Is It Beneficial or Just a Fad?